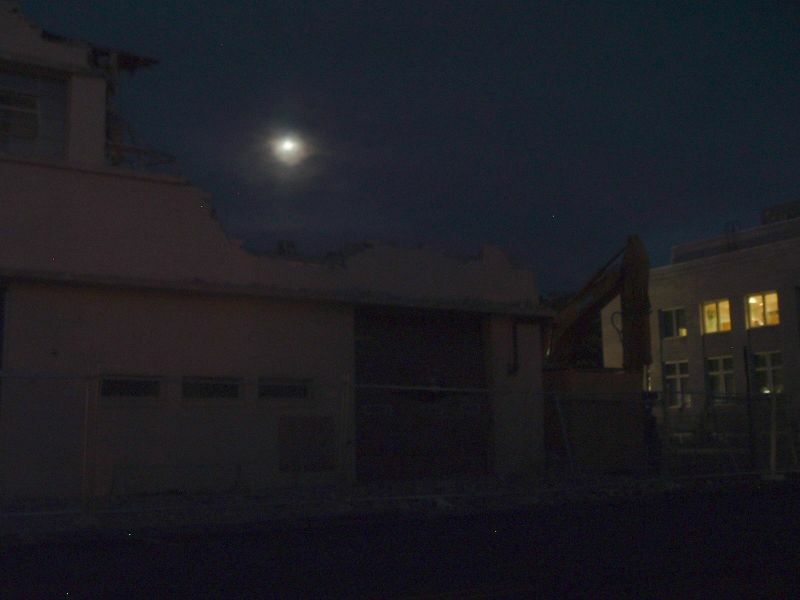 The heavy equipment finally rolled in and started tearing down Fire Station #1 today. And, of course, this was a day I wasn’t heading into Carson. I had to stay at home with a sick little boy, so I didn’t get into town until after dark to see the damage. I did manage to get a grainy picture with my cheapo little camera, but it’s not too fantastic. I think I need a better camera. Anybody have any pictures from today they want to submit? The demolition probably will just take two or three days, but I’m not sure if they’re working over the weekend. I guess we’ll find out tomorrow! Update 2005-10-15: They did stop work over the weekend, and I got better pictures of the destruction. You can see them on this page.